Together, we’re better. This is a truism for people, businesses, governments etc. but also for brands. This is called co-branding, or ‘science of alliance’. The co-branding philosophy is that the market shares and partner incomes increase in comparison to the competitors (stronger market position) because they receive more brand awareness. Together they can put out more commercials, because one ad gives publicity to two brands (a bit like “buy one, get two”). Obviously two brands don’t get together for no reason, there has got to be a certain connection. There’s someone for everyone and every brand gets hitched now and then, from luxury brands to food producers. Barbie also took a road trip down the aisle with Volkswagen Beetle. 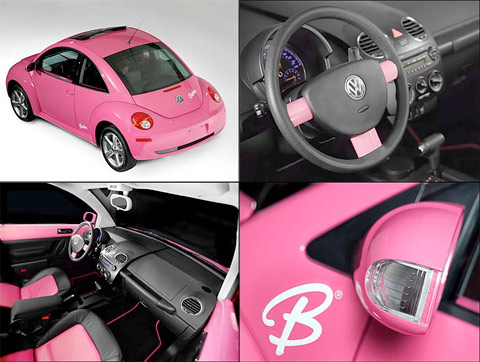 Parents as well as the children could cruise around in the pink Beetle, a real vehicle to match the plastic mini version. Some collaborations even transcend the ‘while supplies last’ disclaimer. Take for instance the McDonald’s McFlurry marriage with M&M, the Oreo McFlurry, the KitKat version or even the sugar waffle ones. The flurries have been available for years and are still a raging success. In the US, AMC movie theatres collaborated with some brands to make a ‘healthy’ snack package filled with Chiquita chips and Dasani water. These partnerships aren’t always very obvious. CNN, which aims for an older crowd, and VICE, an international media company for young people, started a controversial affair in 2010. 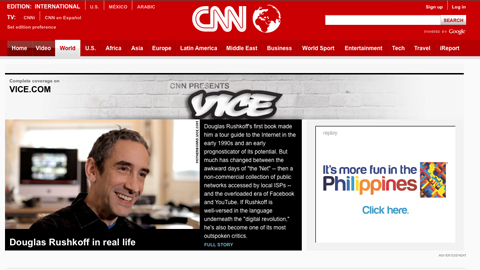 “CNN presents VICE” (the name of their co-brand) might seem an illogical partnership to some. The differences in reporting and target groups of both channels are quite large. Vice targets a much younger and edgier audience than CNN, creating special news reports which show a ‘different side of journalism’. CNN adds news credibility. Vice adds edgy credibility. However implausible their match may seem at first glance, these brands know the tricks of the co-branding trade. Even though they have little in common, their collaboration has been a big success. Sadly this isn’t always the case when brands get together. Just like in a marriage between people, things don’t always go smoothly. And when something goes wrong, a divorce is often inevitable. When one of the brands gets some bad publicity, both brands risk brand damage or crisis. It also happens that only one partner benefits from the partnership or practical issues get in the way. Take McDonald’s McBreaker for example: a yogurt snack in a special wrapping, that was sold at McDonald’s and produced by the Dutch company Friesche Vlag. McDonald’s has been working with them for a quarter of a century for the production of all their milkshake and ice cream mixes. They made big plans together: the McBreaker was going to go international. That never happened though, because McDonald’s felt the production was going way too slow and there were logistical issues with the production and delivery of the packaging. Even though so many things can go wrong, a lot of brands still put a ring on it on a daily basis. Why do they take the plunge? The announcement of two brands collaborating creates an instant buzz for everyone involved. Especially if there’s a special twist to it, like when international sports brand Puma said ‘I Do’ to Japanese store chain Beams, in a ceremony on a Benelux bus. They created an action called “Catch the Bus”, a very unique way of co-branding: people had to run to catch the bus, the only place where the exclusive Puma x Beams of Glory sneakers were being sold. But let’s end with a Mad Men truth: “The most important idea in advertising is “new”. It creates an itch”. And that is exactly what good co-branding does. It creates the idea that a ‘new’ brand is being created without actually having to do just that.